In the Bears 23-17 win against the Steelers at Soldier Field, the offense ran the ball exceptionally well – accumulating 220 yards on 38 attempts. With the running back tandem of Jordan Howard and Tarik Cohen, there is no question the offense should revolve around the two backs. Even though the rookie is inexperienced, he has shown in preseason that he is accurate on the run and can extend plays with his legs. Both of those qualities can enhance what the offense can do. But, sadly, those qualities don’t exist in starting quarterback Mike Glennon. Despite the Bears (1-2) pulling off the upset against the Steelers (2-1), the offense was one-dimensional. Glennon ended the day with 101 yards on 15 of 22 attempts. He was inaccurate, threw a fourth-quarter interception in dangerous territory and was incapable of avoiding the Steelers’ pass rush, resulting in him taking some bad sacks. Glennon also didn’t complete a pass to a wide receiver until there were just under six minutes left in the fourth quarter, which was a nine-yard pickup on third-and-16 to Deonte Thompson. Simple math tells you the play went short of the first down marker, something that Bears fans are accustom to seeing in the offense so far this season. With Glennon under center, the offense has completely abandoned throwing the ball deep. Yes, there are limited options at the wide receiver position, but to keep defenses honest the deep ball must be integrated into the Bears’ offensive scheme. Offensive coordinator Dowell Loggains seems hesitant to call any plays that have his receivers and tight ends go beyond 10 yards downfield. The 6-foot-6 quarterback is comfortable and content with hitting his check downs, which is why Howard lead the team in receptions (5) against the Steelers. The offense that the Bears are currently running is not complicated. Glennon is being asked to look at one to two targets and then throw short to his check down if nothing is open. There is no reason to think the No. 2 overall pick can’t hand a ball off to his running backs and complete simple passes. But with Trubisky at quarterback, he can build off the Bears’ running game by utilizing play-action. Trubisky on a rollout play-action pass adds an entirely new element to the offense, which can hopefully get the Bears’ downfield threats more involved. On the other hand, Glennon hasn’t shown he is athletic enough to throw on the run and that’s why there haven’t been any designed rollout passes. When it comes to throwing the deep ball, Trubisky has the accuracy and maneuverability to avoid pressure to extend plays. Even subpar receivers with a little additional time can separate from their man. When Glennon attempts to avoid a pass rush, he is just looking to stay alive and not to potentially make a play downfield. The Bears win against the Steelers showed that even without a passing threat the team has the talent to compete with some of the best teams in the league. But when opponents find ways to stop the Bears’ running game, what happens next? Are the Bears going to expect to beat opponents with dink and dunk passes from Glennon to the running backs? That game plan is getting repetitive and predictable. When the Bears are trailing in a game, they can’t expect that kind of passing attack to move the ball effectively downfield. 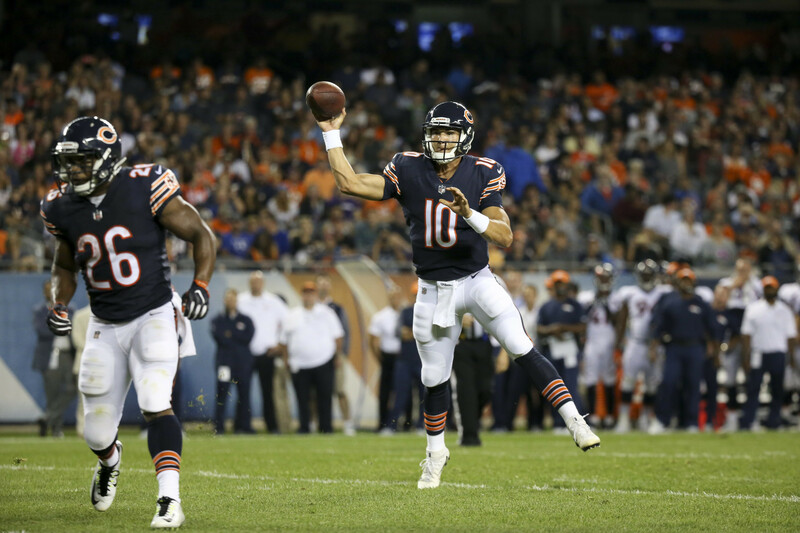 For years, there has been substandard play from the quarterback position and that is what is currently holding the Bears back. The organization shouldn’t limit itself to Glennon just because he was promised the starting job in the offseason. Plain and simple if the Bears want to increase their chances of winning, they must play Trubisky. But if the Bears are content with being one-dimensional on offense, expect the wins to be scarce just like they have been the past three years. It is amazingly clear Glennon cannot go through his progressions. He freezes up and can’t think. Painfully obvious. Start Mitch already!! You know who else could run and throw on the run and knew the offense and was still under contract for one more year? Yeah. Upgrade to Glennon. Killin’ me.